The one thing that I have learned about events over the years, is that there are so many moving parts and no matter how prepared you are, there is always going to be surprises. Planning events takes a lot of patience, organization and creativity. Weddings, birthday parties, launch parties, any sort of event, all need to have a well thought out plan. I was born to plan. I plan my social life, my professional life and my trips; I am constantly making lists and getting all my ducks in a row. My tendencies have led me to a basic structure or formula, when planning events. This is probably the most difficult to do because there are so many variables. Depending on the occasion, I would highly recommend doing a quick search and looking into what other events are around the same time. You want to make sure large events are not scheduled the same day as your event. This will drastically effect your attendance. You may also want to consider altering the date of your event to accommodate the vendor you would like to work with the most. Certain vendors are in high demand and may not be able to stick to the schedule you have provided. I am a visual person, so I love Pinterest Boards. They are an amazing organizational tool. I use it to brainstorm, get ideas for decor, layouts, you name it. All the items I need to buy for the event I usually add to the Pinterest board so I can have it all in one place. When Pinterest created secret boards and allowed you to add collaborators to your board, they definitely had event planners in mind. I probably should of put Excel above Pinterest but it is not as fun. Excel is essential for organization. If you have paperwork for your event, be sure to make a check-list of all the paperwork that is required before the event. On a separate sheet make an event checklist. I like to separate mine into sections, dividing by timeline. I have one second of tasks that needs to be done a few months prior to the event, a section for a couple weeks, then a couple days and then the day of. On another separate sheet make an event budget. If your event has a guest list, I would also make a separate sheet for that. Add an additional sheet for the event timeline. Run through the agenda for the event to figure out the timing. This is especially important for speeches and planning meal service.The sheets can go on and on, but when everything has a place everything runs smoother and you have a more all encompassing view for your event. I have found so many wholes in my events after I go through this process. Little things like forgetting to rent bread bowls, or sugar spoons or organize parking tend to come to light. Tables, chairs, entertainment, people, they all need to be allocated space in your event. Measuring is so important, it seems so trivial, but it is completely necessary. Make sure you know all the sizes for the elements at the event, where all your power sources are and any other regulations to ensure that your event is safe and up to code. Knowing your maximum occupancy is vital information as well. There are lots of amazing event tools that can help you with this; Excel is good for simple layouts, but when it is more more complex, I like to use Planning Pod. The event plan is usually my last step and the key to success. The event should have a general framework and structure, but the event plan fine tunes all the timing. Each person involved in the event should have their own separate description of their role, where they should be and what their tasks are. I like to time everything, so everyone knows the place they should be at any given time. The event plan includes set up, the program for the duration of the event and take down. A mistake that I have made is totally forgetting to specify where everything goes when it is time for take down. Take down in the worst! Everyone is tired and they just want to go home, but like I said having a plan just makes it that much more bearable. This also ensures that you don’t have missing event rentals post event. I left this one to the end, because it all depends on the event. The social media strategy for your wedding is probably…well none. You don’t want randoms showing up to your event. At most you want a hashtag and maybe a Snapchat filter the day of. However, for public events social media strategy is important. Ideally for a large scale event a couple months promotion is best. This allows for enough time to do pre-sales and then general admission. Having more money upfront for events makes things easier on everyone involved. Knowing your break-even point is also important. If tickets aren’t selling you need to know when to pull the plug. Deciding on a creative direction that attracts your audience plays a large part in the effectiveness of your promotional strategy. Make sure your creative has the right tone and captures the right design aesthetic. Once you have nailed that down, decide on the avenues to promote the event. Most cities have so many free event listings to capitalize on. A quick google search of events in your city, will help you uncover the majority of them. Make sure all your marketing includes your event hashtag. It is a good way to track the social media promotion you gain from your event. The hashtag has to be easy to find so use it frequently when leading up to event. To learn more about using social media for your business, visit my social media cheat sheet post. It is such a great feeling producing a successful social occasion. The weeks of planning all come down to one day and then it is all over. These tips are just the general basics, to keep you on track. 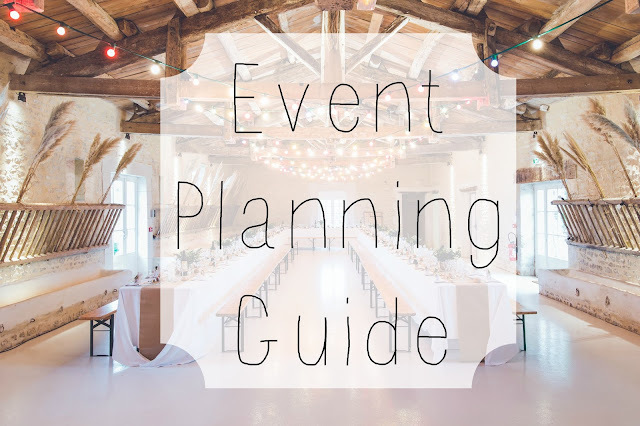 If you have your own experience with event planning, I am always looking for new tools and recommendations to help everything run smoother. Happy planning!